It often happens that iPhone, iPad, or iPod users come across different iTunes sync errors when synchronizing files, such as data loss, duplicates or others. Today, we are here with the best iTunes alternative for Mac that can help them secure photos, videos, music, ringtones, e-books, podcast, etc. between iPhone and Mac to protect data and free up space on the iPhone. Want no more iTunes sync errors? This is where the MacX MediaTrans can help you. MacX MediaTrans is a data management tool for your iPhone, iPad, and iPod that goes beyond the capabilities of iTunes and offers you additional flexibility when copying your media to and from your iOS devices. You can copy different media and file types directly between your iPhone, iPad or iPad and your Mac without having to use iTunes. With the first installation of MacX MediaTrans, we found the user interface to be clean and simple, but otherwise not impressive. The blue buttons on the main dashboard along with the blue header on the other pages seemed dated and reminded us of a Windows application (MacX MediaTrans also has a Windows version), which was ported to the Mac platform but long forgotten. A recent (free) update (version 3.5 was released on March 23, 2017) replaced the boring blue and white buttons with multicolored icons that correspond to the iOS applications. In addition to the original buttons for Photo Transfer, Music Manager, Video and Flash Drive, the new dashboard add icons for eBooks and Ringtones. We think this improvement makes MacX MediaTrans much more attractive and gives a strong signal that it was made for Mac and not just a Windows function. You can create and manage playlists without iTunes limits and you can manage tracks, albums, and genres in batches. MacX MediaTrans lets you transfer your videos directly to your iPhone or iPad and automatically converts videos to iOS-compatible file formats. 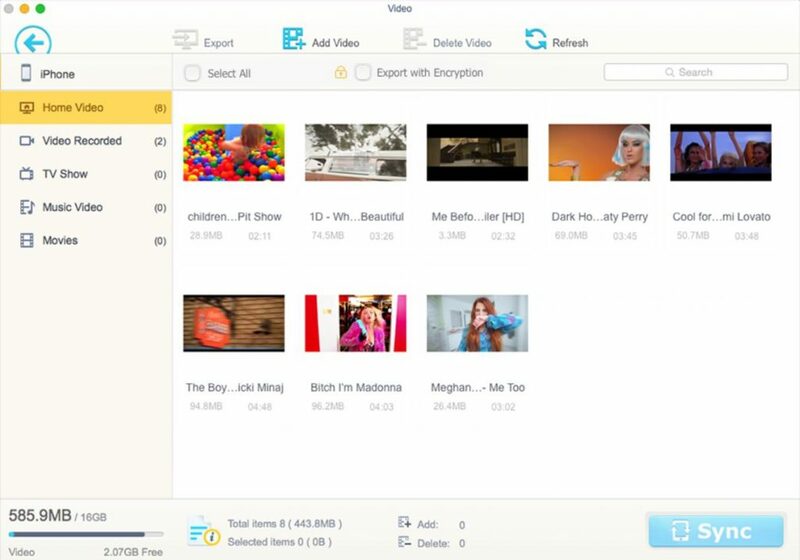 Video formats such as AVI, FLV, and MKV can be compressed and converted to Apple-compatible formats that take up to 50 percent less space on a device. You specify file sizes to better manage movie storage. Photos are displayed as thumbnails along with all your albums, so you can find photos quickly and easily. MacX MediaTrans also offers you the option of using your mobile device as a flash drive, allowing you to create your own storage area for those files that otherwise could not be transferred by iTunes. MacX MediaTrans supports iPhone, iPad or iPod with iOS 7 or newer, Mac OS X 10.7 or newer (macOS Sierra included) and iTunes 11.2 or newer. The installation of the application is easy. We downloaded our copy directly from the MacX MediaTrans site. By mounting the .dmg files you get a window with the MediaTrans icon and the icon of the Programs folder. You simply drag the MediaTrans icon to the folder icon. The installation takes approximately one minute. When you launch the application for the first time, you will see a message box asking you to turn off the iTunes option to open it automatically when the device is connected. This is a protection to prevent accidental deletion of files via iTunes when you use the MediaTrans application. There is also a start-up screen that tells you to connect your iPhone to the Mac. Interestingly, it reminds you that if the iPhone is already connected to the Mac, you must disconnect and reconnect it to recognize the MediaTrans application. The screens for the different functions all work in the same way. The left side of the screen contains the groupings of data on your iDevice. That can be photo albums, playlists, book types (eBooks, PDFs, etc.) and video types (films, home videos, music videos, etc.). The rest of the screen contains the individual files that are currently on your device. 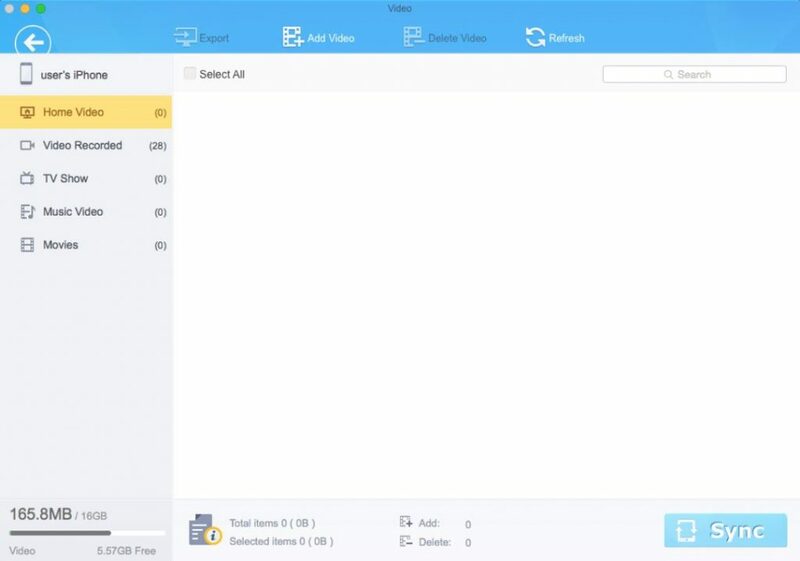 At the top, the functions are available to you, including adding new folders or files, deleting files or exporting them. These options vary depending on the type of files that you are currently working with. When we first heard about MacX MediaTrans, we wondered if applications like this are needed, since iTunes is included with every Mac. After we have used it for a while, we have a different point of view. Like many users, we not only have photos, music, and videos on our Macs, but we also have separate and sometimes more complete libraries. Until we discovered MacX MediaTrans, we went through the sometimes painful process of moving music or other files to iTunes so that we could sync them with our iPhone or iPad. Using MacX MediaTrans eliminates that intermediate step and allows us to instantly load and unload a variety of files between our server and mobile device. The amount of time we save is noticeable. MacX MediaTrans is available for a free 30-day trial period or for purchase with a 30-day money-back guarantee on the MacXDVD website.